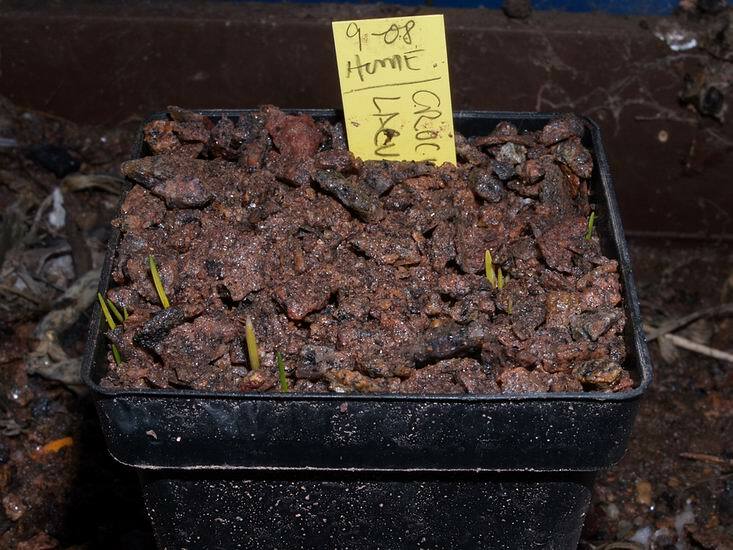 Well here we are at the last Bulb Log for 2008, the 312th of my one year project started back in January 2003. Checking back to the first Bulb log it had eight small pictures and around 500 words - it seems that I have got more long winded since then as the average log now has 15 larger pictures and an average of 1200 words. 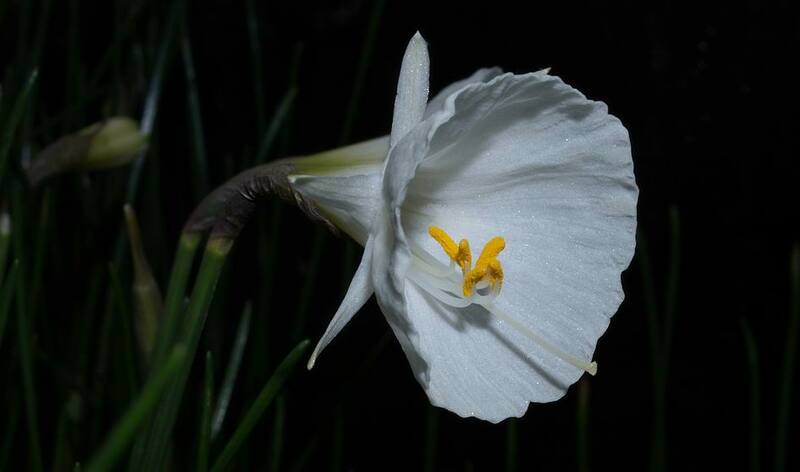 The bulbs are the stars for me and the reason I continue writing the log - none more so than the very reliable Narcissus romieuxii mesatlanticus. 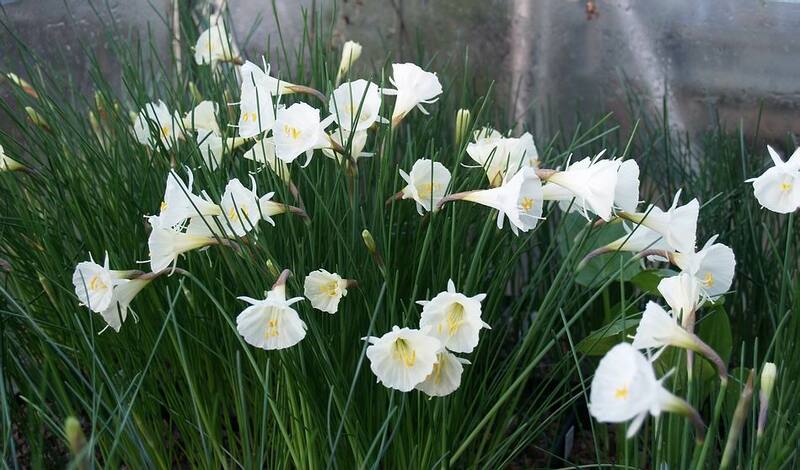 It is one of the more forgiving of the winter flowering hoop petticoat Narcissus - undoubtedly it has more tolerant requirements in cultivation as it flowers well every year and would be a good one to start off with if you have not grown these wee beauties before. A close up of the flower reveals its beauty with the golden pollen standing out in contrast to the off white corona and petals. 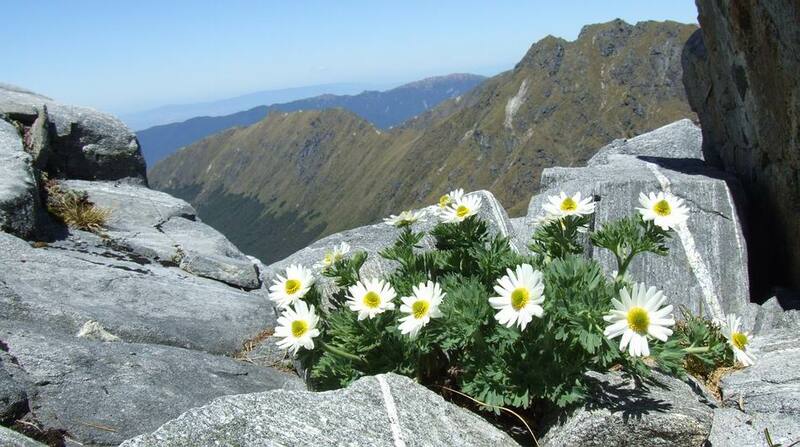 Although I nave no proof I have a suspicion that this great plant may have some Narcissus cantabricus blood in it. My reasons are that the style and stigma are not exerted from the corona as they are in most forms of N. romieuxii and it has a slight scent which again you find in N. cantabricus but not to any degree in N. romieuxii. One that I showed last week which is known to be a hybrid between N. cantabricus monophyllus and N. romieuxii (not as I mistakenly said last week N. cantabricus foliosus). These flowers are a creamy white as they are opening but turn pure white by the time they are fully expanded. 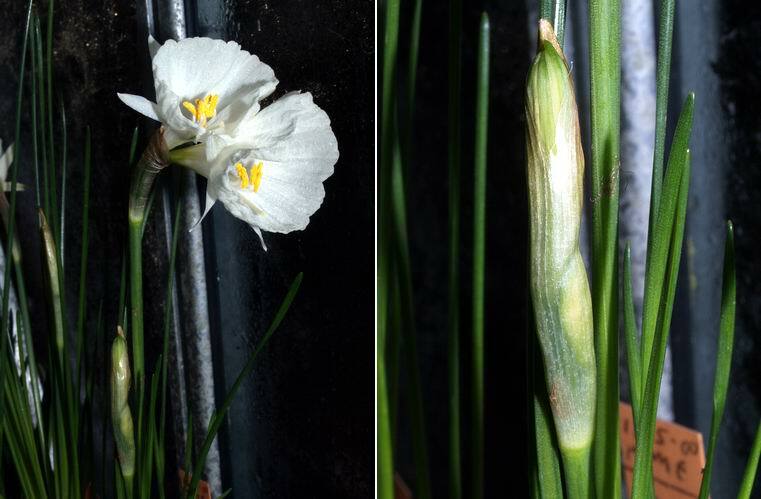 Also last week I showed you with some excitement this Twin flowered Narcissus seedling from N. 'Camoro' and now I can see that the second flower stem rising from the same bulb also has two flowers. I am not sure that this is any great beauty, some may like it, but as the second stem also has two flowers it seems more likely that this is a genetic change to the plant and will persist in future years. To me the big potential here is the possibility that if this feature could be passed on to future generations then this could become a great pollen parent given that there are not any other multi headed Narcissus flowering this early in our garden. Needless to say I will be pollinating several other forms with this parent and back crossing as it also could be fertile. 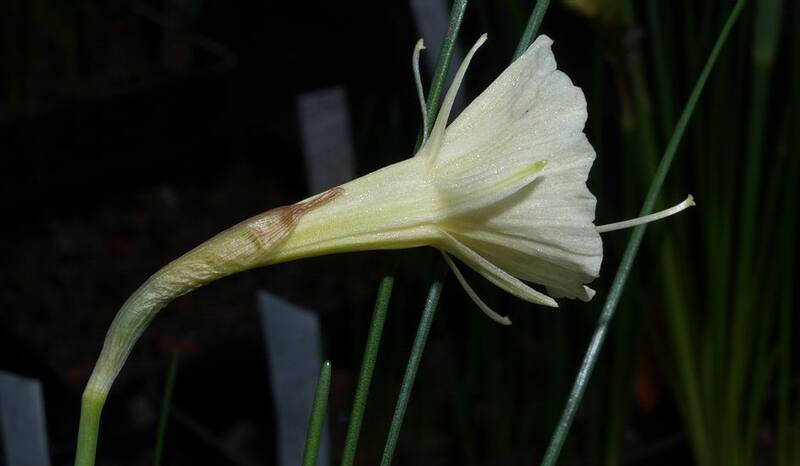 There is much speculation as to whether there are dozens of species of hoop petticoat Narcissus or of there is just one polymorphic species - one thing for sure is that there is a lot of variations in the wild; we can leave it to the botanists to debate if they are all good species or not. One thing I will say is that if the botanists think they have a problem sorting out the wild populations they should have a look at the cultivated stock where these very promiscuous flowers inter breed enthusiastically. Photo above is another Narcissus from this section, with creamy flowers held horizontally - it is flowering for the first time. 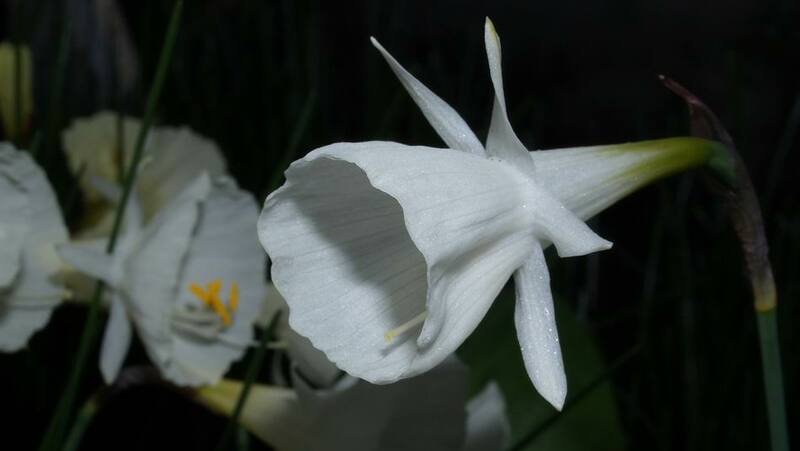 Above is yet another example to show some of the variations we can find - this time the pure white flower is held at a slight angle pointing upwards. I show you this pot of Fritillaria to illustrate a point that I have made before of how easy it is for bulbs in a collection to get contaminated with other taxa. This pot of Fritillaria was not re-potted for two years during which time stray seeds, from both a Narcissus and an Ipheion which I did not collect in time, have fallen in and germinated. I did re-pot it this year but decided to leave these friends together as the fritillaria bulbs are still small and bulbs always grow best in pots if they have company. 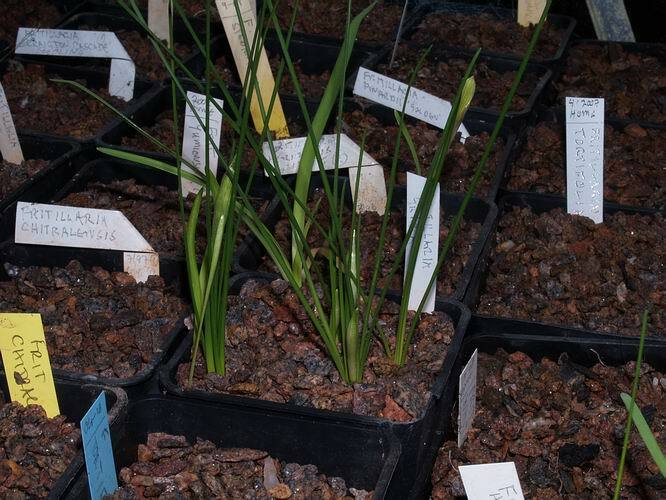 It is very easy to identify and separate these very different types of bulbs but when a stray seed falls into a pot of the same genera then I have a problem and that is when mix-ups can and do occur. 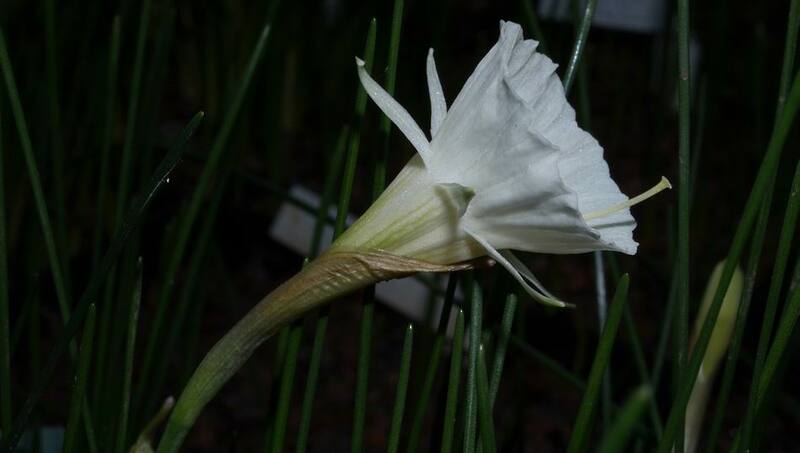 The beautiful elegant long tapered pure white corona of Narcissus cantabricus foliosus with its delicate sweet scent is always the first of this species to flower for me. 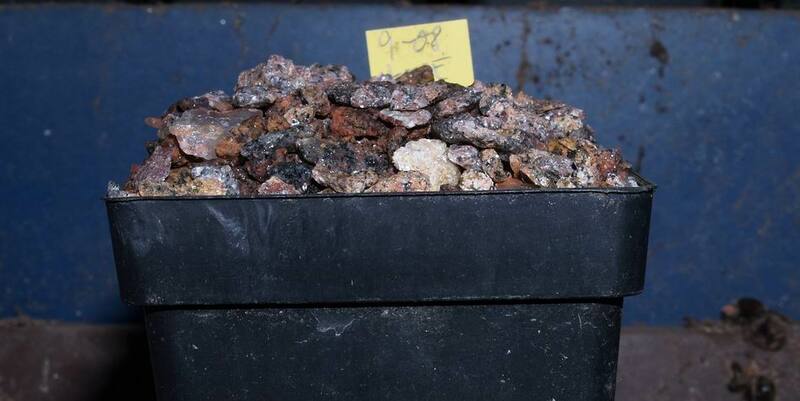 It increases well and is long lasting making it very different from some of the other forms, varieties and subspecies of N. cantabricus. 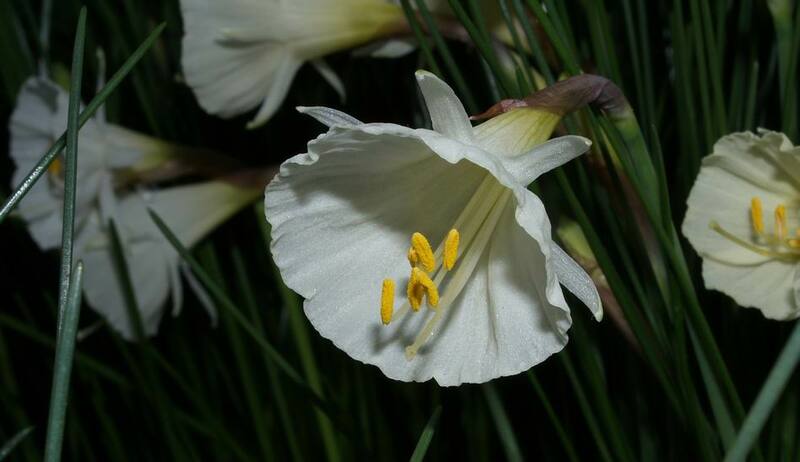 To ensure you get a good increase and flowering sized bulbs for next year it is vital that you provide these Narcissus with plenty of food and water through the winter when they are growing. 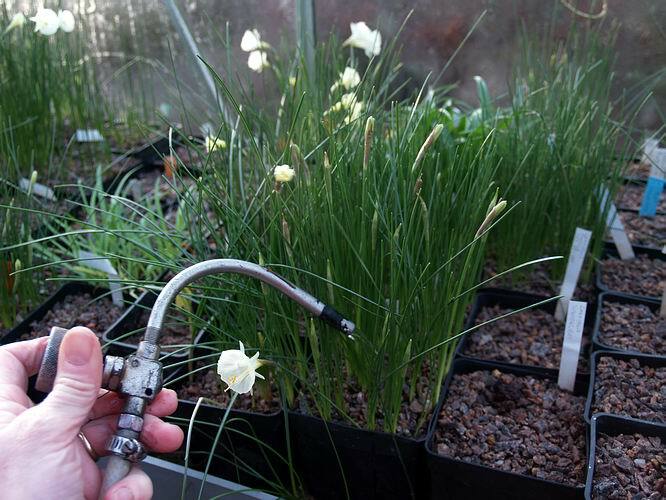 On a mild day this week I switched on the outside hose pipe and watered all the bulbs; as to feeding, there will still be plenty of Nitrogen and Phosphorous from the bone meal that I add to my potting mix and it is a bit too early to add the Potassium - I will start to do that as the flowers fade early next year. It seems to me that while the bulbs can survive as long as there is some moisture in the compost, what they thrive on is a good drench of water thoroughly soaking the pots which also takes air and oxygen down to the roots. Doing this a number of times through the winter when there is no frost and the pots can drain quickly will result in better bulbs. While watering the pots I also gave all the seed pots that are under glass a good soak and I noticed a number of them are erupting as if something is pushing the gravel top dressing upwards. The answer is that it is the seed germinating and the new shoots growing which is heaving the compost up and out. As you will know I sow my Crocus seeds deeply at least half way down the pot and there will be plenty seeds in this 7cm pot so when they start to grow they combine to push the compost up. A good watering helps wash the compost back down revealing the first seedling leaves reaching the surface. 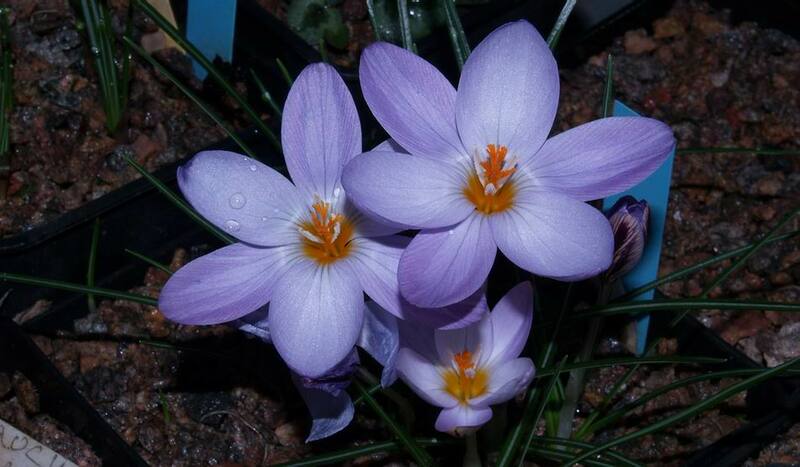 A look around to see what else is in flower in the bulb house at the end of 2008 and that good old favourite Crocus laevigatus, which has forms that flower in the autumn, winter and spring, is there to greet me opening in the unusually mild 12C. 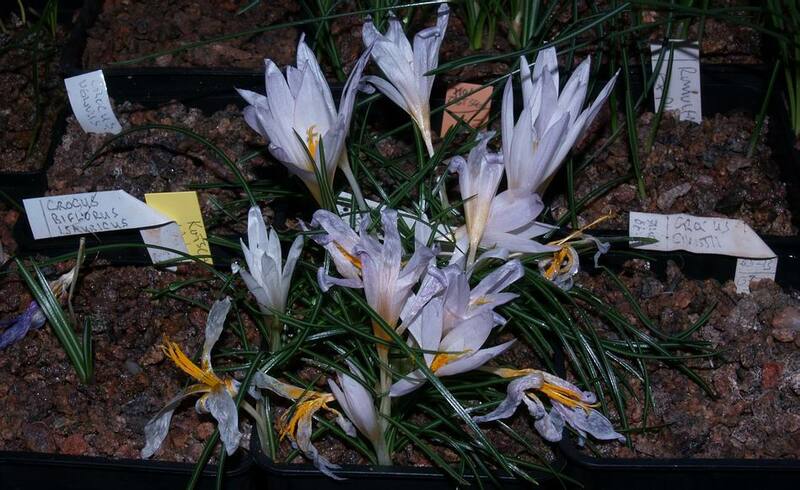 Another good crocus for mid winter flowering is Crocus caspius and you can see that this pot is still flowering. This same pot of corms produced its first flowers way back in October. My troublesome pot of Crocus niveus is also still providing a display with a few new flowers just opening. I call it troublesome not because of how it grows but I find the naming of it a bit confusing as it does not look quite the same as many of the other forms of C. niveus I grow but when I key it out it seems to fall into that species - I must mark the label and check the corm tunics again next summer when I re-pot them. So that is it for another year; it remains for me to thank Maggi for checking my spellings, Fred Carrie our Web Master, and Len Rhind for producing the very useful Index to the Bulb log. Most of all I want to thank all of you who read the Bulb Log every week for your support and encouragement. For something that was supposed to last for one year only it seems to have taken on a life of its own - it does take a lot of work and discipline on my part but it is your support that keeps me writing and while bulb growing is a cyclical and repetitive process each year brings new attractions. My highlight for this year has to be my fantastic trip out to New Zealand where I got to see the magnificent scenery and plants and meet many great friends - I hope to meet many more of you in 2009. 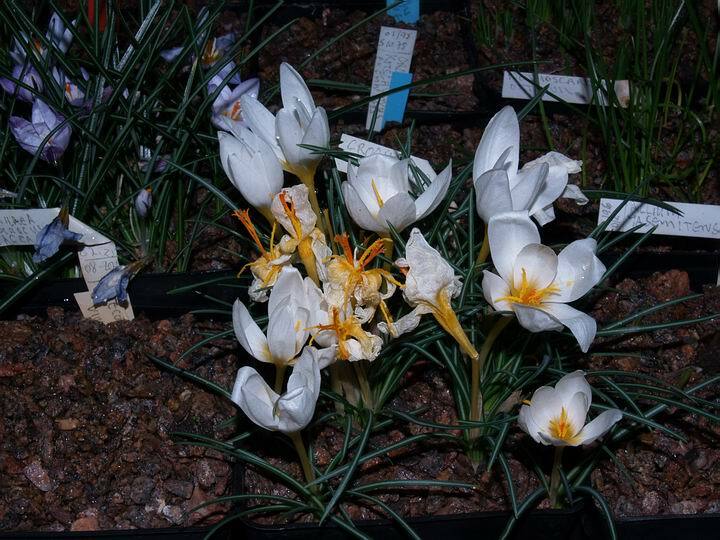 If you are not a Member of the SRGC and enjoy this website and Bulb Log perhaps you would like to help support us by Joining up. Check out the many other benefits you can enjoy by being a member of this wonderful Club. The next Bulb log will be online not next week but the week starting Monday the 5th January 2009.